AH09. Kalinin Small USSR Maidens 4n 3.5"
Small Kalinin blonde maidens. These pokered maidens dressed in green and pink. The two largest dolls have a berries and leaf pattern. 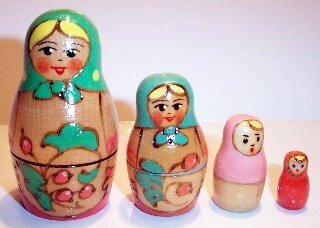 The two smallest dolls are plain.